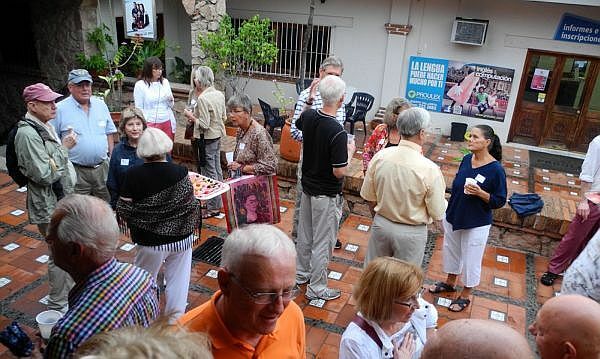 Puerto Vallarta, Mexico - After serving two years as the President of the Puerto Vallarta International Friendship Club, Dan Grippo is stepping down. Here, he takes a look in the rearview mirror at the time he spent in office. Every achievement of the past two years as well as the many achievements of the IFC in years past have come about through the work of countless volunteers donating their time, talent, and treasure. These accomplishments are not the work of one person or a small group of people, but rather of many people each making their own special contribution. To mention one volunteer would be to leave out 10, so let me just thank every volunteer for making the past two years so successful. Some of what has been accomplished in the past two years thanks to your efforts follows. • Reunification of Home Tours and two stellar years of growth in Tour Guests, from a total of 1227 guests to 1985 guests (a 62% increase over two years). • More than doubling the number of Mexican charities the IFC supports on a monthly, ongoing basis year round. • Continued service to the community via the IFC flagship program of Cleft Palate Clinics, Surgeries and Aftercare. Thanks to tireless volunteer efforts by IFC members and volunteer medical staff that have come from Guadalajara for decades to support this program, we have served hundreds of children in need. • Growth in the International Friendship Club's Community Service budget, providing emergency food, supplies and other support to marginalized communities and IFC charities. The needs are ever growing and thanks to strong donations we have been able to grow our response to those needs. • Creation of a new Education Committee of motivated volunteers that in two years has researched and vetted countless nonprofit organizations and distributed block grants totaling more than $200,000 pesos to more than a dozen local educational institutions. • A revitalized "Patrocinio" Medical Cost-Share program that has involved IFC members in helping to sponsor Mexican families with serious medical conditions and needs. • A newly established IFC Dental Outreach program that is helping many children living in the Boca de Tomatlan and southwest region of the bay receive dental care, many for the first time. A recent IFC $60,000 peso Dental Outreach special grant will help furnish a dental office in a new Health Clinic in Boca, first of its kind. • A new English Outreach program that, thanks to active volunteer involvement, offers free English classes and personalized language assistance to Mexicans with limited economic resources. • An active schedule of lectures and talks at the IFC on topics ranging from Aging to Mexican history, chanting to skin care, expat finances to exotic travelogues. Cultural enrichment and education for one and all! • A revamped offering of Spanish classes at four levels, three mornings a week, led by a popular and skilled instructor. • A new Saturday morning "Gentle Yoga" class, accompanied much of the year by mindfulness meditation class. • A new "Hollywood Classics" theme for the IFC's Monday Night Film Series that drew strong attendance this year. • Continued popularity of bridge classes, social bridge, social hours, the preferred merchant restaurant discount program, a first ever IFC Cook-Off, and other popular social benefits of Club membership resulting in very healthy membership totals. • Significant upgrade to IFC Clubhouse electrical and ventilation systems, security, and appearance. Made the IFC clubhouse accessible free of charge for community wide services such as Consular visits and teacher training programs, as well as provided space in exchange for donations to special interest groups, often offering popular features to the community such as the new Wednesday Night movie series. Finally, heightened publicity efforts made possible by hard working volunteer writers, local editors providing generous coverage, website "techies" and Facebook aficionados getting us online, and the best publicity of all, word-of-mouth personal outreach. The result of all this hard work? Friendships and lasting bonds across town and across nations and cultures, and the gratitude and satisfaction of having made a real difference for the good!